What is common between Jessica Alba, Halle Berry, Anne Hathaway, Jessica Biel, Kate Beckinsale, Amanda Seyfried, Ashlee Simpson, Eva Mendez, Jaime King, Dania Ramirez, Zac Effron, Ryan Reynolds, Tom Welling, Michael Weatherly, Shiloh Fernandez and Max Irons? Well all these big names have been trained by Hollywood’s Hottest Celebrity Trainer Ramona Braganza. Widely acknowledged as one of the top personal trainers in the world among the entertainment industry, Ramona has worked as Jessica Alba’s personal trainer for the last 12 years and has been credited for getting new moms back into shape with her 3-2-1 Baby Bulge Be Gone program. Along with Ramona, The Sanghvi Group is launching a new concept MyHomeFitness by Ramona, a personalized fitness concept delivered in people’s homes. Focussing on core and functional training, MyHomeFitness by Ramona will deliver will international standard fitness services at one’s doorstep and customized to each individual’s requirements. So now you have all the more reason to stay fit, as you know can have your gym come home. 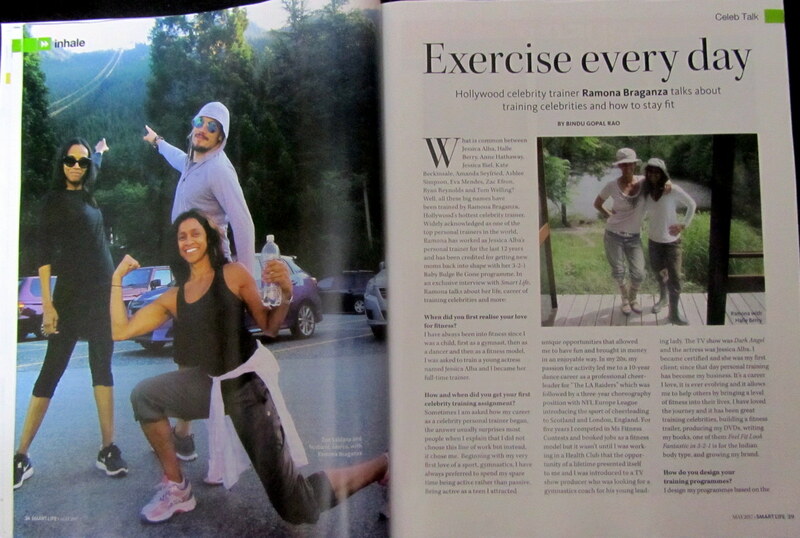 And when it is has been done with an expert like Ramona, you know that this is a great way to stay fit. Speaking exclusively to Smartlife, Ramona tells us about her life, her experiences with celebrities and more in this tête-à-tête. When did you first realise your love for fitness? I have always been in fitness since I was a child as first as a gymnast then as a dancer and then as a fitness model. I was asked to train a young actress named Jessica Alba and I became her full time trainer. How and when did you get your first celebrity training assignment? Sometimes I am asked how my career as a celebrity personal trainer began, the answer usually surprises most people when I explain that I did not choose this line of work but instead, it chose me. Beginning with my very first love of a sport, gymnastics, I have always preferred spending my spare time being active rather than passive. Being active as a teen I attracted unique opportunities that allowed me to have fun and brought in income in an enjoyable way. In my 20s my passion for activity led me to a 10-year dance career as a professional cheerleader for “The LA Raiders” which was followed with a 3-year choreography position with NFL Europe League introducing the sport of cheerleading to Scotland and London England. For 5 years I competed in Ms Fitness Contests and booked jobs as a Fitness Model but it wasn’t until I was working in a Health Club that the opportunity of a lifetime presented itself to me and I was introduced to a TV show producer who was looking for a gymnastics coach for his young leading lady. The TV show was Dark Angel, the actress was Jessica Alba, I became certified and she was my first client, since that day Personal Training has become my business. It’s a career I love, it is ever evolving and it allows me to help others by bringing a level of fitness into their lives. I have loved the journey it has been great training celebrities, building a fitness trailer producing my DVDs, writing my books, one of them “feel fit look fantastic in 3-2-1 ” is for the Indian body type, and growing my brand. How do you design your training programs? Is it harder to work on training celebrities? I enjoy working training celebrities, they are very motivated and have great will power and commitment. You have trained so many Hollywood celebrities – please share some interesting experiences. I worked with Jessica Alba for over 12 years travelling around the world on fun movies. We even filmed in Borneo that was an exciting place! I recently worked with Dakota Johnson and Jamie Dornan on 50 shades darker, they used my fitness trailer to train in. This was a long shoot almost 5 months as they filmed two sequels back to back and the second one is coming out next February. Tell us about your 3-2-1 program? The 321 Baby bulge be gone program is my 12 week 3 phase postpartum workout I have used to get several of my celebrity new moms’ back to pre baby weight including Jessica Alba, Halle Berry and Ashlee Simpson Ross. Based on my 3 cardio 2 circuit 1 core program it progresses new moms in a gentle and effective manner. What kind of training regimens do you recommend for any person to stay fit? For someone to stay fit, it is necessary to do something every day, even it is just walking. Fitness is about being healthy and that includes eating properly. Cardio, strength training and a strong core as well as flexibility training should take place every workout like my 321 Training Method found on my website ramonabraganza.com or as an app Ramona321pro. What are some common mistakes people make while exercising? A common mistake people make while exercising is socializing too much. The breaks between exercises should be restricted to a maximum of one minute. Also not drinking water throughout the session is a common mistake as staying hydrated improves performance. What is your advice for people to lose weight? To lose weight take your time, do not do anything overboard, such as binging and eating, or getting some stomach staples put in, instead flex your will power an stick to a plan, of eating less and exercising more. Please provide our readers with some nutrition tips. I believe in creating simple easy to follow meal plans that suits a person’s lifestyle. Meal plans must be customized. Your diet is an extremely important part for being healthy. Stick with it when trying to lose weight, involve your family and friends, get regular body work done in exchange for eating so healthy. If you are interested in having me come and teach about 321 nutrition plan, one can send me a request via the MyHomeFitness by Ramona app by The Sanghvi Group and we will respond.